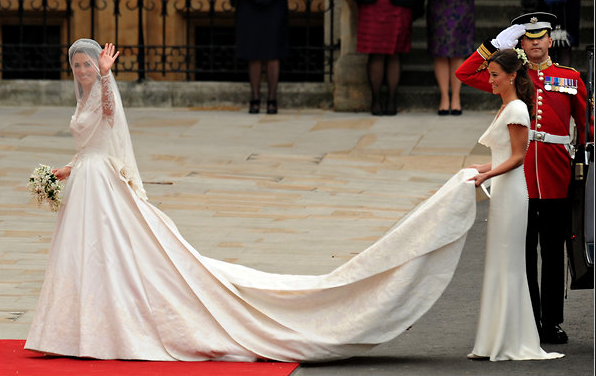 The Sarah Burton designed Alexander McQueen dress. Gina and I woke up at 6 a.m. to watch the ceremony, and it really was like a fairytale. Kate looked beautiful and traditional, her dress was very reminiscent of the one Grace Kelly wore when she wed Prince Rainier in 1956. William looked wildly handsome in his military uniform, and seeing Harry whisper to him briefly as Kate approached the alter made us tear up. After the ceremony and the carriage ride to Buckingham Palace, we dozed until around 8:25, just in time to catch the first kiss(es). InStyle.com has a great gallery of photos. As does The New York Times. Did you guys wake up (or stay up late) to watch the live fanfare? i LOVE this post. her dress was adorable. she is adorable. i wanted to wake up, but it just didn't happen.